All the flavours of fajitas – on a bun! My menfolk had requested Philly cheesesteak sandwiches a week or so ago, but I just couldn’t oblige. I didn’t want anything to do with the state of Pennsylvania after the Pittsburgh Penguins bounced my team – the tenacious Ottawa Senators – out of the NHL playoffs. 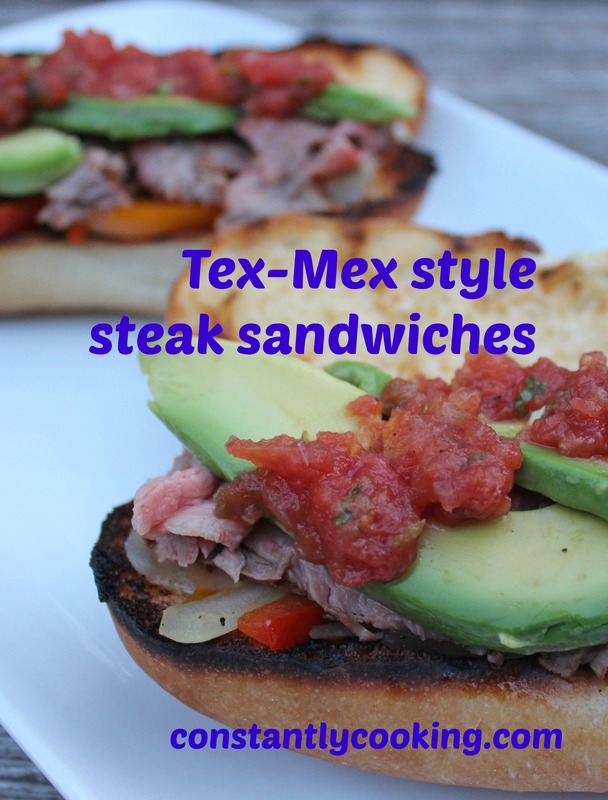 My solution to their bun-steak-cheese request was to come up with this Tex-Mex version, which was a huge hit. If you’re like me and love to plan ahead, you can put the meat in the marinade and toss it in the freezer; it will start to get infused with flavour as it freezes, and finish marinating when you take it out to thaw before grilling. Start by marinating the beef. Put the flank steak in a large zip-sealed bag. In a small bowl, combine all the marinade ingredients, whisking together. Drizzle over meat, then seal bag, pressing air out as you do so. Refrigerate for at least four hours (or overnight), flipping bag occasionally. Remove from fridge 45 minutes before cooking. When ready to start cooking, start by preheating your grill (barbeque) to medium-hot (about 375F). While grill heats, slice peppers and onions. Put olive oil and sliced onions in a large, heavy duty frying pan. Cook over medium heat for 3 minutes, stirring often, until onions are translucent. Add peppers, salt and pepper and beer and cook 2 – 3 minutes more, stirring often, until peppers are tender-crisp and liquid has mostly evaporated. Remove from heat. Remove flank steak from marinade (discarding marinade) and grill for about 7 minutes per side, until meat registers 135F in the thickest part. Remove from grill and place on a tray or plate; cover loosely with foil and let rest for 7 – 8 minutes. While steak is grilling, slice buns lengthwise. Combine mayonnaise and chili powder and spread on the cut sides of the buns. As soon as you remove the meat from the grill and tent it with foil, quickly toast the cut sides of the buns on the grill. Slice cooked beef very thinly across the grain. Cut slices in halves or thirds to create bite-sized pieces. Place on a platter or plate. 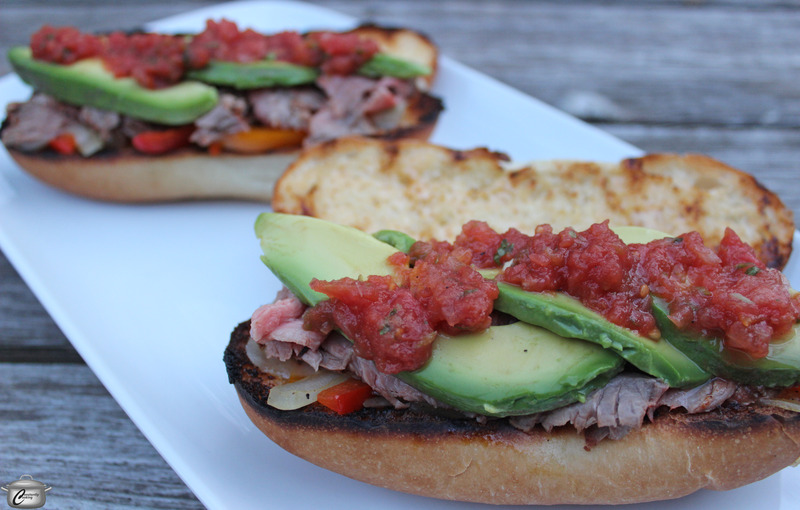 To assemble sandwiches, put a layer of the cooked peppers and onions on the bottom bun, followed by the cheese, sliced steak, avocado and salsa. You can make them open faced or closed, according to your preference. This entry was posted in barbeque, Beef, sandwiches and tagged avocado, beef, easy, fajitas, Flank steak, grilled beef, marinated beef, Mexican, onions, party food, Paula Roy, peppers, salsa, sandwiches, spicy, Tex-Mex. Bookmark the permalink.